Cornwall Plantation Shutters from your local shutter expert. Just Shutters offer you the finest quality shutters, an unbeatable local service and unrivalled reputation. Just Call 01392 342081 or book an appointment here. We are proud to provide the finest interior Plantation Shutters across the South of the UK. Andrew Cook is your local Shutter expert. 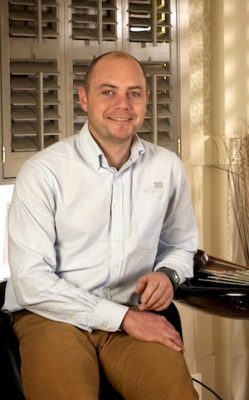 He is Cornwall and Devon’s premier specialist in Plantation Shutters and since 2011 he has earned an outstanding reputation in the field. Plantation Shutters are the fastest growing window covering product in the UK, their popularity has soared as interior designers have taken inspiration from their stunning looks and incredibly versatility. Homeowners are following suit and catching on to the many benefits of shutters. While most people fall in love with the way they enhance their room, the privacy, security and added value mean you’ll keep falling in love time and time again. Shutters can last a lifetime, so confident are we all our shutters come with a lifetime guarantee. Just Shutters are the most trusted shutter specialists in the South, the most reviewed and recommended on Checkatrade, we pride ourselves on our second-to-none quality and service. Shutters are our passion and specialism, we are not a curtain or blind company who fit shutters on the side, we are an expert company dealing with simply the finest internal plantation shutters available offering you the best product at great prices. We hope you find our website informative and inspiring, our galleries and information pages are here to help and our price calculator can help you estimate the cost of shutters in your home, but we are here to assist you further too; please call us for a quick and personal answer to your query, book an appointment or discuss your needs further: 01392 342081. Or you can follow the links below and contact us online. Excellent job of measuring and fitting big very big window. Shutters fitted at the front and side of our home. 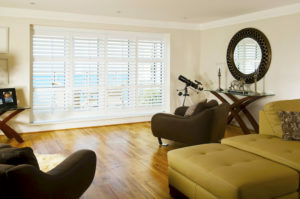 You may also like to see Newquay Shutters, St Ives Shutters, Plantation Shutters Plymouth and Plantation Shutters Devon.